Much like the mythical Atlas, Greece must carry the struggle against austerity on its shoulders as punishment for its government challenging the neo-liberal European consensus in Europe. Atlas. Flickr/H M Cotterill. Some rights reserved.In Greek mythology Atlas is a titan condemned to the task of supporting the world on his shoulders. We could not find a better metaphor for the task before the Greek electorate on Sunday 5 July. To understand why the outcome of the referendum vote affects people far beyond Greece, even beyond Europe, I must dispel the many misrepresentations and mendacities that the mainstream media and most politicians use to distort and discredit this exercise in democratic decision making. The forces of neoliberal reaction have challenged the referendum on procedural and administrative grounds in the Greek high court (challenge was rejected). More surprising and quite disappointing is the statement by the Council of Europe that "the vote falls short of international standards, because the poll was called at short notice and the questions asked are not clear". Both arguments, that the referendum comes too quickly and that the question is not clear, are nonsense. Council of Europe's non-binding guidelines call for two weeks notice, and the Hellenic Parliament approved the referendum to be held in eight days. The allegation that six days constitutes a violation of democracy would seem rather bureaucratic in the most favourable interpretation. I find it difficult not to characterise as duplicitous the "short notice" argument. At the end of June the "institutions" (aka Troika, IMF, European Central Bank and euro group of finance ministers) presented the Greek government with a proposal that it had to accept or reject by midnight 30 June when the existing funding programme would expire. By accepting the Troika proposal the Greek government would violate its campaign pledge to end austerity. By rejecting the proposal the government might have set in motion a process leading to an exit of the euro zone, which it had also promised not to do. A critic of the Syriza government could charge that it should have not promised an end to austerity and to stay in the euro zone. Be that as it may, the Syriza government had made that combined promise. Therefore, the Syriza government faced a dilemma; either choice resulted in doing what it promised never to do. The referendum represented the only democratic way to escape this dilemma, and the ultimatum laid down by the Troika required that the date for it be extremely soon. Thus, if the Council of Europe finds fault in the timing of the referendum, it should take its compliant to Washington, Brussels and Berlin, not Athens. The second objection, that the text for the referendum is too vague, unclear and/or complex for an informed vote, is so absurd as to be laughable. The two documents that the electorate is asked to accept or reject have been publicly debated in Greece for at least six months. The documents state the well-known austerity conditions demanded by the Troika. These are essentially unchanged from what the Samaras government accepted in December 2014, and that confronted finance minister Yanis Varoufakis when he attended his first euro group meeting in February of this year. Wolfgang Schäuble, the finance minister of Germany, has repeatedly stressed the unchanging character of the "bailout conditions", that "Greece will receive no special treatment" (see my previous openDemocracy article). There is a strong scent of neo-colonial condescension in the "unclear" and "complex" criticisms of the referendum text. They suggest a simplicity and innocence among the Greek electorate that makes the Troika the better judge of its interests. This is exactly the argument used by a member of the euro group to disparage the referendum (and the Greek people), which was compounded by the paternalistic assurance from the president of the euro group, Jeroen Dijsselbloem, that he was motivated in his support of austerity by the "best interests" of Greek people. Though the outcome is very uncertain, Greeks are only too aware of what they will vote for or against. That is what causes the anxiety in Brussels, Berlin and Washington. Several media outlets have criticized, even ridiculed, the text of the Greek referendum, asking the apparently killer question, "could you understand this text?" The fact that "it is all Greek" (apologies requested) to the BBC and The Telegraph is hardly surprising -- the documents in question are unknown in the UK but common knowledge in Greece. Another Council of Europe objection is that because of the short notice it (the Council) could not send observers. This represents nonsense squared. If the Council cannot bring together a few observers with a week's notice to observe a major event in modern European history, it is in serious need of reform. To my knowledge the Council of Europe will not be monitoring the UK referendum on membership in the European Union to be held next year (and I doubt that it will send observers to the next German election). Why does it consider Greece a suitable case for democratic monitoring? Again, the scent of neo-colonialism is strong. The near hysteria of the EU leaders in anticipation of the democratic vote in Greece on 5 July manifests itself in quite clumsy and extraordinary attempts to influence the outcome. The attempts are not without their comic aspects, such as the offer by the German president of the EU parliament to go to Greece and campaign for a yes vote -- yes a German politician proposing to campaign in Greece! I suspect that Alexis Tsipras would gladly pay his airfare. Not in the least humorous is the misrepresentation of the vote as in/out of the euro zone. The referendum wording is absolutely clear to Greeks (who will do the voting, not the BBC, The Telegraph or Forbes), reject or accept the continuation of the austerity measures that have destroyed the economy and generated social conflict for four years. In a ludicrous attempt to make the austerity vote appear a euro vote -- and simultaneously discredit the referendum -- the euro group (read "Wolfgang Schäuble") and the head of the IMF has announced that the "offer" that Greeks will vote on is "no longer on the table", rending the vote pointless. In the league of simplistic idiocies this takes first place. Every Greek, whether a "yes" or a "no" voter, knows what will happen if a new Troika programme begins. It will be close to what Samaras accepted last December, and likely to be much more draconic as punishment for Syriza's challenge to the EU neoliberal order. The referendum is the only substantial challenge in Europe to austerity orthodoxy. It is only a slight stretch to write that it is the only substantial challenge in much of the world to this right wing ideology. The leadership of the Scottish National Party pledges to oppose austerity. But the party currently lacks the power to change UK policy, though a Scottish independence referendum could give it that power in Scotland. The Greek referendum may unambiguously commit the country's government to end the austerity policies coming from Berlin, Brussels and Washington, and thus to launch an alternative fraught with uncertainty but creating the possibility of economic recovery. 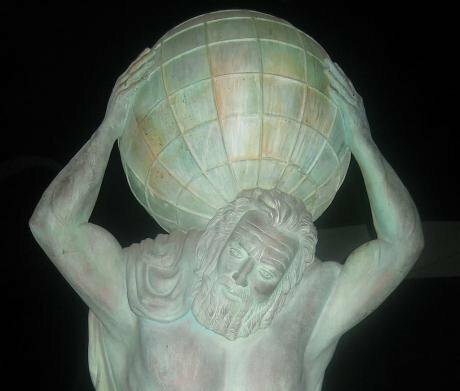 Atlas carries the world on his shoulders as punishment for siding with the titans in the war against the Olympians. The Greek electorate carries the Europe-wide struggle against austerity on its shoulders as punishment for its government asserting the country's policy independence. It is a heavy burden for the people of a small country to bear, and through no fault of its own.